C. Wijeyawickrema, B.A. (Hons. ), LL.B., M.A., Ph.D.
Why did the departing American Ambassador Mr. Ashley Wills wear a Sinhala national dress, at a farewell given in his honor by the president of Sri Lanka (The Island, 6/16/03)? Why did President RP who had a humble beginning, later ordered that government officers must wear a tie? The tie is mandatory part of the “western dress” to enter the parliamentary chamber in tropical Sri Lanka in 2010, even though the Europe copied the kalisama (trousers) from the invading Mongol army! For a Sri Lankan it is so hard to escape from 500 years of colonial mind set. This was why Ranil Wickremasinghe invited Lisbon to come to Sri Lanka to celebrate 500 years of the Portuguese landing in Colombo. The Anglican Bishop Desmond Tutu once said “When the missionaries came to Africa they had the Bible and we had the land. They said “Let us pray.” We closed our eyes. When we opened them we had the Bible and they had the land.” Colonial masters used the gun to physically oppress, and the Bible to mentally conquer, “primitive” non-Europeans. The civilizing mission””‚modernization of the non-European infidels””‚ began first with the initiation and Christianization of those who later became the ruling elites of a given colony, subjecting them to direct and indirect forms of humiliation (John Kotalawala was Ven. Anagarika Dharmapala’s hero for physically handling it). This inevitable humiliation of former colonial people was presented in a new light as an issue of global crisis by Thomas Friedman in his book, The World Is Flat (2005), as opposed to the more Eurocentric clash of civilization thesis of the Harvard professor Samuel Huntington (1996). More than five hundred years of such humiliation in Sri Lanka came to an end in April 2009 at Ambilipitiya when the two Rajapakse brothers, Mahinda and Gotabhaya, applied the Buddhist way of Upatissa Damanaya on the two white foreign ministers David Miliband and Bernard Kushner. The humiliated duo took a beeline to the pavements in front of the UNO building in New York City and “cried” for Prabhakaran’s human rights. In 1905 when Japan defeated Russia it was a cause for Asian pride. Some say Vietnam and Cuba humiliated USA by defeating its aggression. But, in Sri Lanka, the Buddhist approach was used to defeat colonial humiliation which goes beyond a two-country conflict. The rest of the Third World is watching in admiration. When the monk Ven. Maduluvave Sobhitha asked, “What are the grievances that Tamils have that the other communities do not have?” from Kumar Ponnambalam, after pondering for a while, he said “Tamils have aspirations. The late KP would not have lived in Colombo if he had not enjoyed equal or even privileged status as a citizen. But this answer was picked up by Robert Blake and Hilary Clinton among others of the IC and R2P. It was also fodder for Jehan Perera, Ravi Karunanayka, Dayan Jatileka, Sumanasiri Liyanage and Jayadeva Uyangoda. With USA engulfed in bad examples of individual rights or group rights domestically, what was the motive behind this American interest? Thanks to Julian Assange’s WikiLeaks, we now know that the American embassy was worried about Tamils losing interest in group rights or aspirations (secret cable sent from Colombo embassy on 1/15/2010). Tamil farmers and villagers are not interested in 13A or 13A plus, but hospitals, bridges, schools, houses new jobs and the fertilizer subsidy. It is a matter of thinking about Maslow’s hierarchy of needs. Therefore, LLRC should not help USA by resurrecting this dead and defeated answer, as aspirations is a very fluid and subjective item. The other side of the coin is “The world remains highly uneven and riven by conflict. Neoliberal development produces islands of middle-class prosperity in societies that become more unequal overall,” (Geography of Power: the making of global economic policy, Richard Peet, 2007, p. 193). The reaction in Sri Lanka after 2005 to this World Bank-IMF-American hegemony and the India-promoted terrorism and the Tamil homeland myth was the Mahinda Chinthanaya Program (MCP), a home-grown attempt to take local and foreign establishment-bulls by the horns. Countries like Sri Lanka have two forms of governments: the one visible and the other invisible. The latter helps regime change, if needed. In 1956-59, and now after 2005, an out-of-the-box thinking is struggling within a system of the Colombo paradigm. The ability to end a 30-year terrorist war in less than 3 years was an example of wise use of the system to defeat the system. Develop an ATLAS OF SPATIAL JUSTICE project as efficacy of law research (applied law and applied geography) collecting, analyzing data and monitoring progress at GSN unit level. The end of history thesis of Francis Fukuyama based on the fall of the Berlin Wall in 1989 was discarded even before the 9/11 disaster in 2001. New histories are propping up by the day. With the fall of the Wall Street free market system in 2008, even lifelong supporters of free market globalism such as Allen Greenspan are making confessions. Despite the desire to say that the world is flat and there are no states or borders preventing the flow of capital and ideas, both absolute space as well as relative space has become highly relevant in the global village. Since development and underdevelopment are fundamentally related, the geography of uneven development has come to foreground as one can see from the following helpless statement of the World Bank, “The World is not flat, [But] uneven development [spatial injustice] can be reduced by spatially-blind action,” (World Bank””‚World Development Report: Reshaping economic geography, 2009, p. 1). The ten action items above are geographic problems that can be handled utilizing the atlas concept: What are the issues; what are the solutions; what has happened when solutions strategies were implemented; what was the gap between the problem and the solution? What are the new solutions based on lessons learned? Thus, the geography of uneven development becomes manageable via the atlas process. An atlas is a geographic tool. Geography and development go hand in hand. As a spatial science of synthesis, geographers are best trained to handle issues of spatial injustice. For example, Sri Lanka has a half-dozen university geography departments. A comparison of subject specialties listed by geography teachers with the subjects allocated to the cabinet of ministers, there is no ministry which is not represented by a geography teacher. This potential link can be utilized advantageously in taking a spatial perspective on poverty and inequality in human and social geography of Sri Lanka. If LLRC thinks of involving universities in reconciliation efforts, it ought to begin with the geography departments in Sri Lanka. Unlike the West-induced “truth commissions” in other countries such as South Africa, Rwanda, or Northern Ireland, LLRC in Sri Lanka is faced with an issue of removing spatial injustices accumulated as a result of uneven development that had taken place under the Colombo paradigm. It is not an ethnic issue, and it is a language-blind spatial issue””‚poverty and lack of opportunity (regions where malaria is prevalent, what is dry zone are race or language neutral). Villagers with a life style pattern influenced by the basic principles enunciated in the Buddhist Jathaka Stories””‚cyclical nature of life, impermanence and the doctrine of the Middle Path””‚never harmed other human beings because of race, gender, age, religion, language or color. Buddhist societies recognized plant, rock and animal “rights” 2600 years ago. If, LLRC fashions its questions in this light, its final report will have an impact different from hundreds of other Sri Lankan commission reports, printed and not printed. Witnesses appearing before the LLRC, as well as those who think they can at least try to “humiliate” it by not giving evidence, are both operating under the Colombo paradigm that has operated in Ceylon/Sri Lanka since 1815. Since it was the Colombo paradigm that created spatial injustices, discarding or disabling this paradigm is an essential requirement for peace and prosperity of the island. After Colombo captured Kandy, in 1818, there was spatial genocide in rebellious areas, and in 1832, five arbitrary spatial units (Provinces) were created to marginalize the “power” of the Kandyan chiefs. Since then, new spatial units were added from time to time, to improve access to remote areas or to overcome administrative congestion, such as the carving out of the new Gampaha District. It was Colombo paradigm masters who built a new parliamentary complex in a swamp, perhaps the only example of such foolish act in parliamentary history of the world! With the election of a villager as president by a razor-thin margin (a clash between national and foreign forces) in November 2005, Sri Lanka became free of separatist forces after 600 years. Village development or remedying the adverse effects of the Colombo paradigm was a pet topic of all governments since 1948, but the Mahinda Chinthanaya Program (MCP) presented as an election manifesto by the presidential candidate Mahinda Rajapakse reflected a genuine desire to reorient the focus of governmental authority on rural Sri Lanka. Compared to Oxford or Harvard-educated Tamil politicians, it was battle-hardened Vinayagamoorthy Muralitharan, popularly known as “Colonel Karuna,” who understood the pragmatism of the MCP which was based on popular rules of Buddhist economics and Buddhist politics. In 2006 when Karuna said “Give us what Colombo gets,” he did not add anything new. In 1971 “Milk to Colombo, and fodder to the village” was a JVP slogan, and in 1990, the Youth Commission Report copied it. But Karuna’s demand became the tipping point of a paradigm shift due to the fact that Karuna as a well known Tamil went beyond what the Sansoni Commission said in 1980, “If the Tamils’ cry for separatism is given up, the two communities could solve their problems and continue to live in amity and dignity” (M. C. Sansoni, former CJ (Sessional Paper No. 7 of 1980). Karuna accepted what is reasonable in the context Sri Lankan history and geography””‚in other words Sri Lanka has had a spatial development problem and not a separate homeland problem. The World Confederation of Tamils (2006), (www.tamilnation.org) slogan that “There is no state without a Tamil, but there is no state for the Tamils,” ignored the fact that the country in which Tamils have more rights than in their homeland of Tamil Nadu was and is Sri Lanka. Col. Karuna is different because, for the first time since the 1920s, a prominent Tamil came forward, declared his willingness to learn Sinhala, gave up federalism, gave up the 13 Amendment, and to get engaged in politics as a national leader and not a Tamil homeland leader. By his acts Karuna effectively dislodged the “Tamils have aspirations” (not grievances) slogan of the late Kumar Ponnambalam who preached it from his home in Colombo. As Col. Karuna understood it, if Tamil individual rights were protected, then automatically Tamil group rights too would be protected all over Sri Lanka, not in a limited homeland, because a Tamil will be doing not just Tamil politics but Sri Lankan politics. The electorate is not North or East, but the entire island. The habit of labeling any Tamil with courage and foresight to work with the Sinhalese as a Tamil traitor (Mayor Duraiyappa, Minister Kumarasooriyar) was applied to Col. Karuna also by Mano Ganeshan who could live in Colombo and swim in Killinochchi. Devanesan Nesiah, who lives in Australia, wrote a doctoral dissertation (Harvard University) on the above topic””‚discrimination with reason””‚ comparing discrimination introduced by law in India, Malaysia and the USA. (Discrimination with reason: the policy of reservations in the U.S., India and Malaysia, 1997). Nesiah supported the concept, perhaps because as a graduate student he could not deny statements such as, “You cannot legislate against geography,” or “One law for the lion and the ox is oppression (William Blake (1793).” In India discrimination is used for the benefit of over 40% of its population! A minority could enjoy powers and privileges over a majority community due to historical reasons such as, the divide and rule policies of colonial masters, communist party members in Marxist societies or under the Apartheid policy in South Africa. The lost rights and dignity of the Sinhala Buddhists in the Colonial Ceylon, and after 1948, also falls under this category. In this context the 1956 Sinhala only language act with reasonable use of Tamil added to it (1958) was discrimination with reason. Professor James W. Gair, in his book, (Studies in South Asian Linguistics: Sinhala and other South Asian languages, 1998, Chapter 14: How Dravidanized was Sinhala phonology? Pages 185-199) states, “Sinhala [language]’s survival as a clearly Indo-Aryan language can be considered a minor miracle of linguistic and cultural history.” The language of 70% of people has suffered 500 years of discrimination. Ironically, it was a victory-bound military general Sarath Fonseka, who publicly introduced and applied this reasonableness doctrine with regard to Sri Lankan ethnic debate, before he became a victim of a Colombo paradigm-based local and foreign political conspiracy (what Fonseka did in November 2009 reminds what Hugo Chavez, inventor of a new Bolivarian Alternative for Venezuela (and Latin America) faced with the American-backed military officers in April 2001). Fonseka said in essence, “Sri Lanka is the only home of the Sinhala people, and the minorities have equal rights, opportunities, and freedoms to live in it, but the minorities should not make unreasonable demands.” The Soulbury Commission Report also warned about the unreasonable nature of the Tamil separatist demand, but those who came to power such as Sir Oliver G, Sir John and Esmond Wickramasinghe ignored it. What Nesiah (in 1997) said about India, Malaysia and America, and what Fonseka (in 2008) said about the Sinhalese can be linked to what the late professor G. P. Malalasekera (in 1956) said about the Sinhala Buddhists. “The Buddhists wish””‚and quite rightly””‚that in this country where they form 70 percent of the population, Buddhism should be recognized as the predominant religion of the people. In the rest of the world, Ceylon is regarded as essentially a Buddhist country, and they want this claim established here as well”¦They will not be content to remain in the position of inferiority to which they have been reduced by 450 years of foreign occupation”¦ They have no desire to make Buddhism the State religion””‚in spite of the cry raised by self-seeking politicians””‚ but they want the State to help them rehabilitate themselves and undo some, at least, of the injustices perpetrated against them during the days of their subjection.” (quoted from a speech by Professor Gunapala Piyasena Malalasekera, President of ACBC, reproduced in Times of Ceylon, January 15, 1956, and referenced on page 196 of the book, “Ceylon: Dilemmas of a New Nation,” by W. H. Wriggins, Princeton Univ. Press, 1960). The process of uneven development in the colonial Ceylon was given a social interpretation by two groups: young Marxists returning after foreign education, and a group of Christian Tamils returning to Colombo from Malaysia. If examined spatially, by 1948, Ceylon had two countries (lands). The Colombo Region was the English-speaking, western-focused modernized rulers country; the villages were the Sinhala-Tamil speaking country of the most humiliated and the under-served. If examined from a non-spatial perspective one sees what the late Colvin R. de. Silva saw in 1956, two nations based on languages. He however, saw the exact opposite in 1968 and 1972. He as well as those history and political science graduates of the University of Ceylon failed to take a spatial perspective. Colonial system was based on an open economy of exporting raw materials to the mother country and importing finished products to the colony. The uneven development with its negative externalities was a result of this policy. This policy was based on capitalism of the Adam Smith type (invisible hand), and a moral justification based on making colonial people “modernized and civilized.” For this, to proceed on the path of peace and good governance, from 1832, a system of communal representation was introduced, which lasted a full century, until territorial representation was introduced in 1931. While communal representation was an imposition of spatial injustice on the majority community, during 1921-24, Sinhala and Tamil Colombo politicians reached an agreement for an electoral ratio of one Tamil for two Sinhala representatives (balanced representation or a formula of Tamils + Muslims + Burghers = Sinhalese; this is what USA is asking Iraq to do in 2010). The spatially unjust nature of this sneaky arrangement became manifest with the granting of universal suffrage in 1931, and the adoption of territorial representation. Yet, Tamil separatist remnants’ demand against “Sinhalization” continues even after it was militarily defeated on November 18, 2009. Because Colombo paradigm was benefitting the ruling elites of the Sinhala, Tamil and Muslim origin, they did not nor could not oppose Tamil separatism on the basis of its manifest unreasonableness. Additionally, one gets the impression that these foreign-educated Colombo ruling families did not have a basic knowledge of the history or geography of the island. Thus, despite clear evidence to the contrary coming from the island’s population geography, that regional ethnic enclaves were not a viable option, under the B-C Pact of 1958 and the D-C Pact of 1966, provisions were made to give land control powers to the Tamil separatist side. This fundamental defect (erecting ladders to jumping monkeys), was continued with the 13 Amendment in 1987, different facets of President CBK’s Package Deals during 1995-2000, CFA 2002, ISGA, PTOMS and in the majority report of APRC chaired by the Marxist minister Tissa Vitharana. The only location-specific other instrument, aimed at the poverty-stricken, plantation-disloged rural Sinhala farmers, the Kandyan Peasantry Commission (appointed in 1947, report submitted in 1953) was also a failure in its effectiveness. The late Prime Minister, SWRD described S.J.V. Chelvanayagam as (Hansard vol. 31 (June 3, 1958) cols. 244-5) ” [he is surely] one of the most dangerous types of human beings in the world, quite in his own way sincere, in his own way an idealist, but having no idea whatsoever of reality and the practical side of things. Very dangerous people, such people are capable of deluding themselves completely, capable of deluding others too” (SJV Chelvanayagam and the crisis in Sri Lankan Tamil Nationalism, 1947-1977 by A. J. Wilson, 1994, p. 10). The Ilankai Thamil [Kosovo] plan was floated first by SJV Chelvanayakam in Dec 1949. In 1952 SJVC talked about the Yugoslav model aiming at “another Pakistan in Ceylon” (Wilson, p. 42). AT SJVC’s funeral, Rt. Rev. Lakshman Wickremasinghe identified SJVC (who belonged to the Church of South India) as a Tamil Moses (Wilson, p. 73). Wilson also thought that SJVC was hailed as the “prophet-seer of the Tamil people” (Wilson, p. 82). After the July 1970 General Elections SJVC felt “only God can help the Tamils” (Wilson, p. 114). Ironically, SJVC lost that status in 1975 when he garlanded a statute of Sivakumaran who committed suicide after trying to assassinate a superintendent of police. By then SJVC was convinced that the only alternative was to fight to the end for a Tamil Nad (Wilson, p. 127). Compared to an individual, groups of people could have all kinds of aspirations. Thus, Turkey has an aspiration to become part of Europe. May be it followed the secular Muslim state model with this idea in mind. But France says Turkey cannot be part of Europe. Turkey can be in NATO security agreement and have various economic agreements but it cannot be a unit in the United State of Europe which is a repository of white and Christian heritage. The Pope also said this until his recent visit to Turkey amid controversy generated by his statement that some Islam kings in the past were less than civil. Even the USA is not immune from this aspiration headache. Puerto Rico which is under U.S. control has three options. It can try to become the 51st state of USA or it can become a commonwealth within USA or independent. The governor of Puerto Rico wants the middle choice to become a commonwealth because then Puerto Rico could maintain its Hispanic schools, court system and going to Olympic games with separate identity without losing the benefits of U.S. citizenship they now enjoy and without paying taxes if it becomes a state. As a U.S. state it will not be able to achieve its aspirations to be able preserve its Hispanic identity because it cannot have all inclusive Hispanic schools or go to Olympics as Puerto Ricans. The World Federation of Tamils has an aspiration to have a Tamil state recognized by UNO with its own flag. They think Sri Lanka is a ripen target to achieve this dream. Tamil Nad had as aspiration to become a separate country which got buried (not dead) in 1963 after the Chinese invasion of India. Two caste groups in Tamil Nad today are demanding two separate states for them. Tamil Nad already has enclaves carved out under the Pondicherry model. Indian army is facing aspiration troubles in Kashmir and Nagaland. Goa in India had an aspiration to be a Portuguese appendage until Nehru had other aspirations. Hong Kong had an aspiration to be free from China but the British did not want to mess with China. Taiwan is still working with its aspirations. The Dalai Lama also has a noble aspiration on behalf of the people of Tibet. An aspirations path creates conflict in Sri Lanka because the Sinhalese suffered more than any others for 500 years of colonialism, and that Sri Lanka is the only real estate they have. The Muslims have source regions (or funding pipes) outside Sri Lanka, and it was said there are 100 million Tamils dreaming for a country of their own. Christians have Pope. Scotland, Belgium and Ireland are examples of unstoppable nature of aspirations in breaking up countries. After the Government of India Act of 1935 and the language-based reorganization states in 1957, India could not solve the balkanization trend in the sub-continent. Just like the Germans had to go through de-nazification training after the defeat of Nazism, an entire generation or two of Tamils need proper understanding of the history and geography of Sri Lanka. Sri Lanka’s population geography provides the best evidence on how to bring ethnic justice (equality of opportunity, no language minorities in the island) based on the concept of spatial justice””‚erasing the adverse effects on people due to uneven development under old imperialism and the neoliberal economic policies of new globalism. Tamils, Muslims and the Sinhalese have similar grievances. Action items 1-3 mentioned on page 4 are based on patterns revealed from these maps. Tamil separatism was based on the wrong and unreasonable notion of “group rights” instead of an individual’s right to equality of opportunity. Individual aspirations are best achieved at family level, if families are empowered to take part in public decision-making at the grassroots or Jana Sabha (GSN/Village Council) level. Sri Lanka’s population is more than a mosaic; it is like a scrambled egg dispersed all over the island. Group rights require carving out of separate ethnic territories. 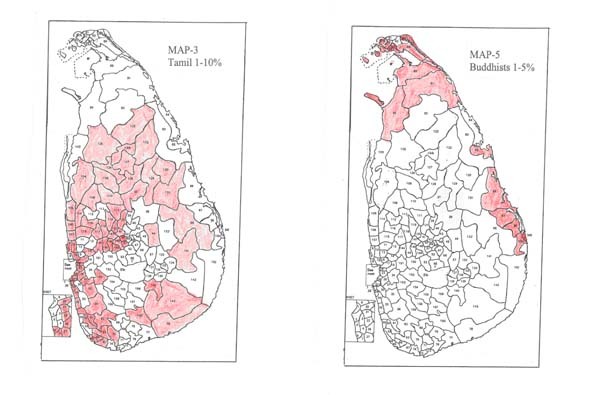 The source of data for the five population feature maps presented in this essay came from G. P. S. H. De Silva’s “A Statistical Survey of Elections to the Legislatures of Sri Lanka 1911-1977″ (1979). A Microsoft Excel table was developed using race and religion percentage data of voters at the 1977 General Election. In calculating Tamils per electorate, Ceylon Tamils and Indian Tamils were combined thus giving them an advantage at the electoral level rather than treating them separately. In the case of Sinhalese, rather than race, the religion, Buddhists was used. This way Christian Sinhalese were separated, and the number of Sinhalese at the electoral level was disadvantaged. When Prabakaran’s cousin brother was studying with me in Canada in 1979, he said that the biggest headache they had was the scene of yellow robed monks roaming in Jaffna. I used this logic in deciding to use religion instead of race. 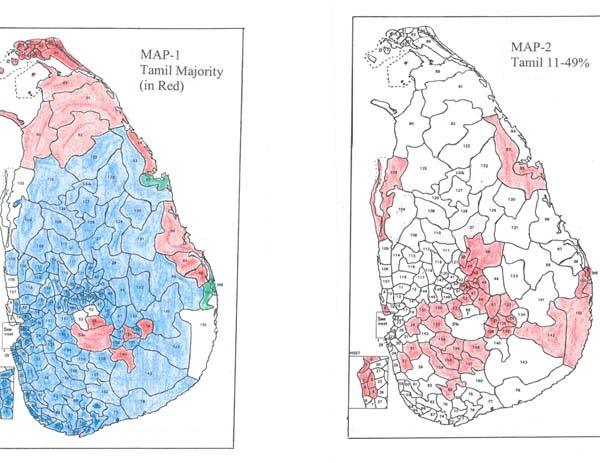 Professor Howard Wriggins (who was US Ambassador in Sri Lanka during JRJ presidency), in his book, Ceylon: Dilemmas of a new nation (1960) produced several maps with 1947, 1952 and 1956 electoral level ethnicity data. Most maps we see are based on administrative district level data. Depending on the spatial unit used maps can give misleading messages. Provincial or District level maps can hide rather than reveal useful information. If race and religion data are available at polling station level, that will be the ideal spatial unit. But on the other hand, it could become so complex, making it difficult to recognize relevant spatial patterns, if any. This map shows (all maps are placed at the end of this essay) 1977 electorates where Tamils (red), Muslims (green) and Buddhists (blue) are 50 percent or more. If the democratic principle used is territorial representation based on majority, only 12 electorates remain empty making them electorates with no ethnic group claiming majority. They were Puttalam, Wennappuwa, Nattandiya, Negombo, Ja Ela, Wattala, Gampola, Nawalapitiya, Colombo North, Colombo Central, Colombo West and Potuvil. If Muslims are added Puttalam, Colombo Central and Nawalapitiya fall into the category of minorities over 50%. This map plays a gap-filling role for map 1. Those empty electorates on map 1 become areas with significant numbers of Tamils. They form a kind of transitional zone between Buddhist and Tamil regions. If the World Tamil Federation is determined to have a separate Tamil country in Sri Lanka, then this is the region that will become the zone of conflict. This map shows the electorates that the Majority APRC Report wanted to provide Tamil police stations or Tamil police officers! Buddhist approach of “Come and examine (not come and believe in God-based religions),” current suggestion is to promote the idea of a Tamil Buddhist monk in each village temple! APRC proposal was based on the logic that after July 1983 incident, Tamils have a security problem in living with the Sinhalese. That episode was an act of politician-supported Colombo City thugs. This map shows the Catholic Belt in Sri Lanka. Red color indicates electorates with Christian over 30%. Between 10-29 is in green and 1-9 is in blue. Not a single church was attacked during the past 100 years until the unethical conversion workers abused religious tolerance and started smashing Buddha statutes and urinating on broken pieces. These maps represent almost 40 years old data. A map based on 2010 data will indicate the migration of more Tamils from North and East to other parts of the island, and therefore, will not change the conclusions based on old data relating to bringing spatial justice. While the World Tamil Forum talks about Tamil genocide, Tamil villagers prefer to go to South to live with the Sinhalese! Because of this population mixture, empowerment of people at the smallest possible spatial scale would help to minimize any unintended ethnic injustice that can adversely affect any citizen of Sri Lanka. In India, in 1993, Panchayat Raj Institutes (PRI) was enshrined as the micro level unit because the Indian constitutional model with language-based macro level state units (1957) failed to deliver socio-economic progress or justice to the Indian masses. With the implementation of the Jana Sabha concept at GSN unit level, Sri Lanka is following the constitutionally-empowered Indian Panchayat Raj Institutions (PRI model) as the basic devolution block at the grassroots level. PRI is closer to Pondicherry model than to the failed language-based Indian model at the macro level. Sri Lanka’s, Gamsabhawa (British governor Henry Ward discovered them in 1856) is similar to the PRI model (ref. The Report of the Local Government Reforms Commission (Sessional Paper No. 1 of 1999, (the Abhayewardhana report). In his book, The Power Pyramid and the Dharmic Cycle, 1988, (chapter 7), A. T. Ariyaratne explained how the Trinity of village-tank-temple worked as an organic unit in Sri Lanka before colonialism crept in. Each village and a chain of villages functioned with a river, oya or ela and one or several water tanks storing water (hydrological units). Sri Lankan rural landscape is replete with thousands of such small reservoir-based hydrological units. They encompass all 24 agro-ecological regions of Sri Lanka (National Atlas, Survey Dept. 1988, p. 45). R. L. Brohier’s map (1934) of the Walve Basin is like a collection of hundreds of small tanks. In the past people prevented flooding by this short river with this kind of water storage facilities in the upper and mid streams. Is it then not possible to adjust/align the boundaries of Village Councils (VC) and their wards (in 1981 there were 549 VCs and 7137 wards, (Abhayewardhana report, p. 452) to fit in with boundaries of watersheds or hydrological basins? Then traditional VCs are converted to ecological-political units at the micro level. I have discussed the relevance of this idea in three previous Island Newspaper essays: “You cannot legislate against geography” (2/22/2006); Language-blind regional development units (10/25/2006); APRC and the Bioregional vision (2/25/2009). There are 319 AGA divisions, 257 Pradeshiya Sabhas, and 38, 259 “villages” in Sri Lanka (www. statistics.gov.lk, 2002 data). Until the 1990s it had about 4000 GSN divisions, which was increased to 14,009 by President Premadasa. By selecting river basins/watersheds as the lowest PRI-type administrative unit for Sri Lanka, this GSN number could be decreased to an ecologically appropriate, socially equitable and economically efficient size. The water tanks inventory prepared by the late Chief Justice Hema Basnayake could be useful in this regard. Recently, from a lawyer’s perspective, retired professor C.G. Weeramantry also presented Grama Rajya as a model suitable for Sri Lanka (Island, 5/20/2007). Since watersheds/basins have a hierarchical order of progressively increasing in area/size they can become a large River Basin Region at macro level. Seven such River Basin Regions could advantageously replace the present arbitrary nine Provincial units (see Map by C. M. Madduma Bandara: 1. Yalpanam, 2. Rajarata, 3. Dambadeni, 4. Mahaveli, 5. Deegavaapi, 6. Kelani, 7. Ruhunu in Chapter 4, in Fifty years of Sri Lanka’s Independence: a socio economic review, edited by A.V. de S. Indraratna, 1998, p.83). In New Zealand, a small country with small river basins like in Sri Lanka, under the Resources Management Act of 1991, local government units follow river basin boundaries www.dia.govt.nz/www.stats.govt.nz). Prior to 1978, there was a gradual erosion of structural democracy (examples: abolition of the Senate, damage to the separation of powers doctrine, political subversion of public service and the judiciary) in Sri Lanka. After 1978 with new election laws the representative-territorial democracy was altered removing people’s right to elect their own representatives. Instead party leaders in Colombo prepared the lists of names of who would become an MP. District-wise and Pradesheeya Sabha-level electoral systems based on preferential vote destroyed representative democracy. For spatial justice at the village level, there is a need to remove partisan politics and to replace it with consensus decision-making. For example, the Panchayathi Raj model in India is based on the principle, the Vedic tradition of God Speaks in Five. Vinoba Bhave explained the Gandhian ideal of decentralization based on Sarvodaya””‚the good for everybody””‚at the village level, “it is a common saying in India that if five speak with one voice, it should be understood as the word of God; that is, our ancients believed in working with the consent of all” (India: the most dangerous decades, Selig Harrison, Princeton, New Jersey, 1960, p.316). People are divided not by ethnicity but by green, red and blue color party politics. During pre-1978 times, the Local Government Ministry did not allow village councils or other local government units to become viable administrative units. Partisan politics ruined them with rigid central control from Colombo without financial, resource planning or technical support. After 1978, VCs and TCs were killed alive, and territorial representation of people became a mechanical scheme at the national as well as the local level. It is painful to read [t]he Report of the Local Government Reforms Commission (Sessional Paper No. 1 of 1999, (the Abhayewardhana report) which discussed in detail the “death” of the local government system. The report now dusting in some ministry office argued with objective facts why the country needs to go back to the pre-1980 village council system. The decision to create a Jana Sabha for each GSN unit is thus the best way to empower people rather than providing a platform for groups of ethnic politicians to become a new set of rulers under fancy devolution packages. The “political solution” that the Americans such as Robert Blake and Hilary Clinton and the Indian ministers and secretaries are recommending, if it meant empowerment of Tamil villagers and not the agenda of an Indian or an American hegemony via two political set ups in the island, is guaranteed by promoting the Jana Sabhas and Village Councils based on ecological (not language) boundaries. Greek City-States and Buddhist Republics in Buddhist India were small scale spatial units. What Montesquieu presented as separation of powers was not a strict separation of the three standard functions (legislative-executive-judicial), but bestowing to a maximum number of spatial units, the sum total of governmental (legislative, executive and some quasi judicial) powers. Otherwise, a system beneficial to the people will not evolve. The capitalist democracy we see today in the world is a system run by ruling classes for their own benefit. Empowerment of people means giving people governmental power at the lowest possible spatial unit level. The American, Kirkpatrick Sale described this as “human scale” in his book, Human Scale (1980). He says everything works best if it is at a scale (size) manageable by local people. This is akin to what we generally identify as “grassroots “politics. In a global village one thinks globally, but acts locally. Or, as the former U.S House Speaker Tip O’Neil once said “all politics is local.” Empowerment works best at the “Small Is Beautiful” scale. With global warming and local floods, droughts and landslides, sustainable development at local level becomes a top priority. A paradigm shift from Colombo to Karuna (village) and a mental shift from “Europe is best” to passing the Kamatha test, cannot by themselves remove spatial injustices. Otherwise, the voluntary service NGO Sarvodaya would by now have created a heaven in rural Sri Lanka, because to some extent it has gone through these shifts. The performance evaluation was however, a big problem it has faced. We all know the performance record of government policies and projects is hopelessly dismal. The official government telephone directly is full of research and planning offices, yet in reality very little systematic research, planning or coordination take place in or among government units. Since all actions take place on land, land use data at GSN level provides the best basis for monitoring and guiding progress. An atlas of spatial justice will be the quarterly or annual report card of this monitoring process. It will be an ongoing system with feedback loops. Action item 10 mentioned above (page 4), is crucial in effectively implementing a grassroots level democratic effort aimed at erasing socio-economic inequities of spatially disadvantaged people. All developmental actions are introduced as policies, laws and regulations. They all impact on people’s land use decisions. Law in book can be different from law in action. There can be unintended consequences of law. The efficacy of law studies in the legal profession are extended further in geography as research in applied law and applied geography (“Applied Law and Applied Geography,” in The Operational Geographer, 8 (1) March 1990, 26-31; Teaching Law and Geography, in Journal of Geography, 90 (3), May-June, 1991). This has become a holistic, integrative approach to socio-economic and ecological problems faced by a world struggling for sustainable development. It can be a solution to Sri Lanka’s complex and complicated human and physical resource management dilemma. Sri Lanka has generated cartloads of commission reports and research publications, yet the efficacy of any aspect of governance is at a very low level. Lack of coordination, repetition, competition, missing records, lack of continuity, lack of monitoring and accountability, are defects known for the past 60 years. There was no concerted effort toward institutional effectiveness or for a robust Quality Assurance system. For example, the 1935 Land Development Ordinance expressly prohibits dividing, selling or mortgaging land allotments, but the biggest problem in these settlement colonies is exactly the rampant violation of the law. Take any other topic or project, it has been the same sad story. Sri Lanka already has some land use and other demographic data collected at the GSN level. The need is to improve this action, covering all GSN units in the Island increasing the number of data variables. No government agency, including the Census and Statistics Department, can undertake this massive task on its own. But it is important that data collected by various agencies brought together and analyzed in a systematic manner. In the 1940s, in the United Kingdom, the late geographer Dudley Stamp undertook a national land utilization survey with the help of public school students. It was continued in the 1970s and 1990s. The proposed spatial atlas of Sri Lanka will be an improvement of Dudley Stamp’s original idea interpreting the data from efficacy of law and spatial justice perspectives. Maps of Sri Lanka will be prepared using data collected at GSN level. It can be called the Mahinda Chinthanaya Atlas, on which the progress of micro and macro-level development projects can be displayed and monitored. The atlas concept can thus become a vehicle for program evaluation. Data collected, refined, analyzed and reported as maps at GSN unit level, and at regional and national level, helps in systemic planning and improvements. Raw data for maps come from existing geological survey and other government maps, government documents, books, and from new surveys to supplement and update data. Raw data are arranged as rows and columns of a table. Each row is a GSN unit. Thus there will be 14,008 rows. Columns are information about each GSN unit. This means there will be all kinds of data columns called variables. For example, head of household report collected by GSN provides demographic data. Crop data can from land use maps of the government and/or from the records of the Govi Niyamaka of the area. The Samurdhi Niladharis will be providing lot of data on their functions. Maps generated using raw data columns give general information about the spatial units covered in that map. The unit could be GSNs in an AGA area or AGA areas in a District or Districts in a map of Sri Lanka. Thus maps can show data collected for the variable called treatment for Malaria. Usually this data is presented as categories using some form of classification. By subjecting raw data to research analysis one can find out associations and relations between variables and also spatial and structural patterns. For example, head of householders’ list showing more fishermen could be associated with a coastal area; more deaths in a given time period could be related to an aging population; high level of crime patterns could be explained by areas of tension called zones of transition from rural to urban. Processes taking place in a society will generate spatial patterns. Actions and programs aimed at promoting tourism will generate spatial patterns of hotels, shops, more traffic, better roads and rich neighborhoods. Link it with the Seventh Great Force (Hathveni Balavegaya) in Sri Lanka. Those who went to universities in Sri Lanka in the Sinhala/Tamil medium and now working and living in the West are the core of this force (Sixth Force is the janitors and maids sending foreign exchange to Sri Lanka). These expatriates will be requested to adopt a village under the MCA project. Link it with a directory of retired talent. Expatriates’ expertise data and Sri Lankan retired talent data will be matched as variables in the atlas database. One variable in the atlas will be manpower or expertise needs of a GSN. Another will be expertise available within a GSN. By matching these two variables a mechanism could be developed for GSN-level exchange of experience and expertise. Adopt a village idea does not have to limit to expatriates. Locals also can adopt villages. Adopt a village idea has to be linked with Colombo officers. For example, an officer in the Planning Ministry or the National Science Foundation could be linked to a village of their choice. Bravo Wijeyawickrema for writing the truth and getting historic facts right… When I saw Karuna’s comment it remind of my late father ( twice Tamils try to blow his car in 60’s in Trinco..all those tried are in the bottom of the sea..) which said the same since, “it is lack of developments in the east that create racist’s agenda with out facts”. Father spend a fortune developing Trinco and getting southerners homes and land and also build the Vishrama Salava (sp?) near the Trinco fort so Sinhalese travelling to Trinco can stay the night.. We also looked after all the Buddhist temples in the East. To me East has so much potential and beauty and Gota ask my self and my brother, how to develop this part and answer is investments to the area including foreign factories. This January, I was in Trinco after 30 yrs and road building is superb and hope govt continue to offer better part of the cake to these areas. This entry was posted on Thursday, December 2nd, 2010. You can follow any responses to this entry through the RSS 2.0 feed. You can skip to the end and leave a response.